You love them on Duck Dynasty! Now they’re coming to Tulsa Tuesday, April 23rd to the Mabee Center! Phil, Miss Kay, Si, Al and Lisa of the A&E hit show Duck Dynasty will be sharing stories of their family, faith, and favorite pastimes! 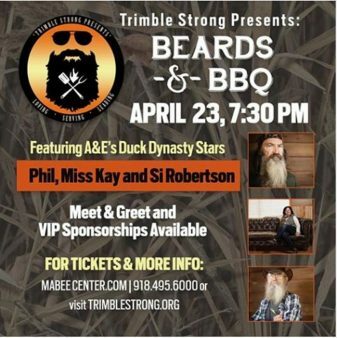 Event proceeds will benefit the Trimble Strong Foundation. You can WIN a pair of VIP tickets including dinner and MEET & GREET passes to meet the Robertsons! Just show us your beard! Don’t worry- it can be fake or a filter or however you want to have fun with it! Just post a photo on social media and then enter below for your chance to win. We’ll pick a winner on Monday, April 22nd!